I surmised 5 years ago that Obama’s cocaine use continued at Occidental. A biography due out next week proves I was correct and that Obama lied — again. I wonder, though, if Obama was as honest about his cocaine use as he could have been. 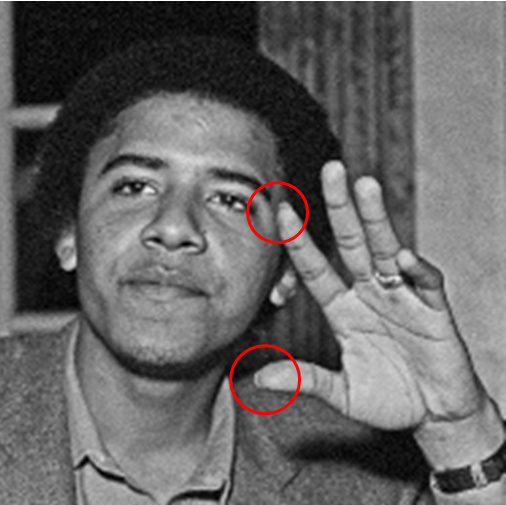 As I noted in my original post, “Obama’s thumb and pointer finger have unusually long nails, while the other nails on his left hand are cropped close?” That struck me, because the day before, I’d read an article about Carrie Fisher’s cocaine use in the 1970s and 1980s, as well as the fact that her coke nail was very visible in some photos. He would spend time with other friends – Hasan Chandoo, Imad Hussain and Sohale Siddiqi, who he had been friends with at Occidental College, in Los Angeles – and Cook said the trio was taking ‘lots of cocaine’.They were far more prolific users than Obama, who she said probably preferred staying home to read than taking the drug. Chandoo – who was later to become a fundraiser for Obama – was the leader, the book claims. While the above does not prove I correctly identified Obama’s coke nail, it sure proves that I correctly identified Obama’s coke habit. The thing with Obama is that no matter how low you go, you’re probably correct.